Make yourself at home in one of the 56 air-conditioned guestrooms. Complimentary wireless Internet access keeps you connected, and cable programming is available for your entertainment. Private bathrooms with shower/tub combinations feature complimentary toiletries and hair dryers. Conveniences include phones, as well as a turndown service and irons/ironing boards. Located in Milan, Super 8 by Wyndham Milan/Sandusky Area is a 5-minute drive from The Edison Birthplace and 6 minutes from Milan Historical Museum. This motel is 13.1 mi (21.1 km) from Cedar Point and 5.2 mi (8.4 km) from Thunderbird Hills Golf Courses. 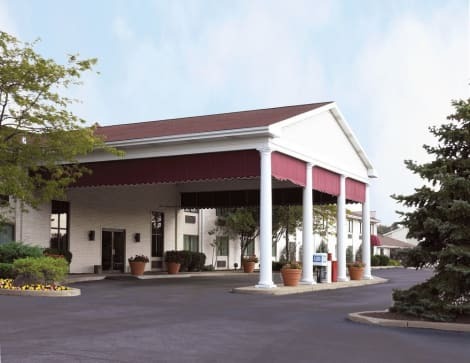 Located in Milan, Quality Inn Milan-Sandusky is in the suburbs, a 5-minute drive from The Edison Birthplace and 6 minutes from Milan Historical Museum. This hotel is 13 mi (20.9 km) from Cedar Point and 5.1 mi (8.2 km) from Thunderbird Hills Golf Courses.